I rolled my tenderloins in a spice rub we got at the Taste of Chicago event that we went to in DC. Any store-bought spice rub should work, or you can improvise and make your own rub. All you really need is some brown sugar, garlic powder, onion powder, salt and pepper. I am sure there are other bonus flavors you could add in, but this is a solid foundation to start with. Whatever you do, just make sure you use a lot of it. I thought I went a little overboard with the rub, but it turned out great. There is a lot of meat, so you need a decent amount of rub. The tenderloins I got were a little to big to fit into a pan for browning on the stove, so I cut them in half… they still came out fine. Tenderloins are partly covered in a whitish membrane called the silver skin. Try to remove as much of this as possible, even though it’s kind of tricky to do. The most important thing to remember: Don’t overcook the pork! The USDA guidelines call for cooking pork way too long. The tenderloin should still be a little rosy in the center, you don’t want it to all be a chalky gray. Adjust an oven rack to the lower-middle position and heat the oven to 450 degrees. 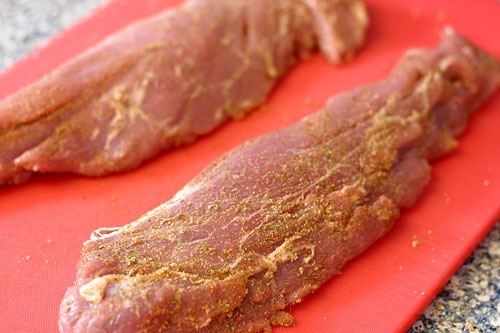 Pat the tenderloins dry with paper towels, then season with salt and pepper (or your dry rub of choice). 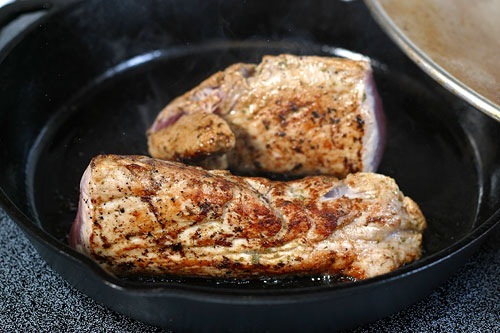 Heat the oil in a 12-inch skillet over medium-high heat until just smoking. Brown the tenderloins on all sides, reducing the heat if the fat begins to smoke, about 10 minutes. 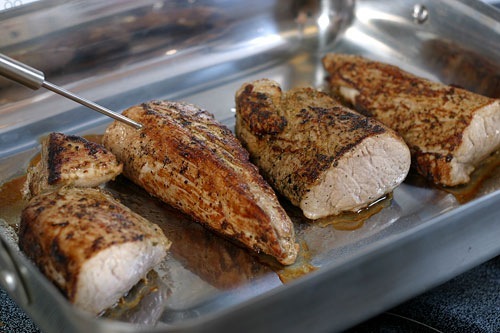 Transfer the tenderloins to a 13 by 9-inch baking dish. 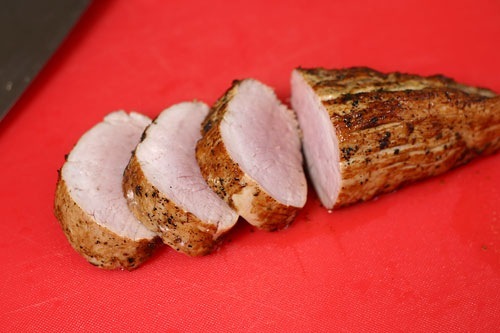 Roast the tenderloins until the thickest part registers 135 degrees on an instant-read thermometer, 10 to 15 minutes, flipping the tenderloins over halfway through the roasting time. Transfer the tenderloins to a carving board, cover with foil, and let rest until the pork reaches an internal temperature of 145 to 150 degrees, 5 to 10 minutes, before slicing into 1/4-inch-thick pieces. Good point Lydia! I usually do, I must have just been in a rush to get this up. I will go try to find a link and add it. Your blog is so well done and professional. You should check out the website http://www.behindtheburner.com for tips and tricks on all things culinary.